This place has died after we all saw each other, partly because blogger was acting weird for me. Mark: Any way you can create a Mad Cow DVD of the tapes you have? I'd love you for it. Jake: Any way you can send out the Mad Cow DVD you already have? I'd love YOU for it. Mark and Jake: Is there any way Mark can send copies of the existing tapes to Jake so he can compile a DVD? That'd be awesome, and I'd watch both of you love each other. Strulson: Tell Meghan (I think that's the spelling) that every time I see her, I like her more. Oh wait, she checks this website, doesn't she. I also love all the other significant others, too. 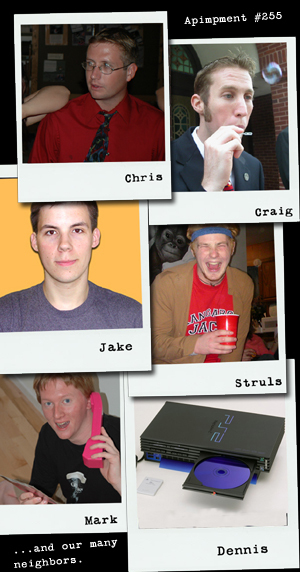 Poor Mark though, who is this year's Chris or the Jake from like 5 years ago. I'm sure I'm missing things, so comment away. I'm going to start investigating relaunching the blog on the new google blogger upgrade -- that way we can keep our login info but maybe organize a bit better. Also, I know new years in on the social calendar, but what else in on the horizon? Maybe a little Virginia get together? We could rent cabins at Skyline Drive (google it, it's beautiful). Just food for thought.